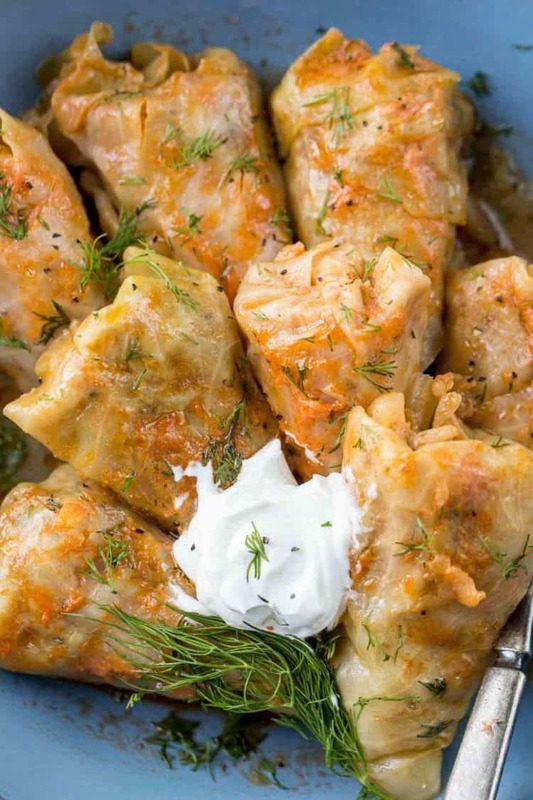 A step-by-step recipe for classic Russian Cabbage Rolls. Stuffed cabbage filled with ground meat, rice, sauteed vegetables rolled in cabbage in a delicious sauce. 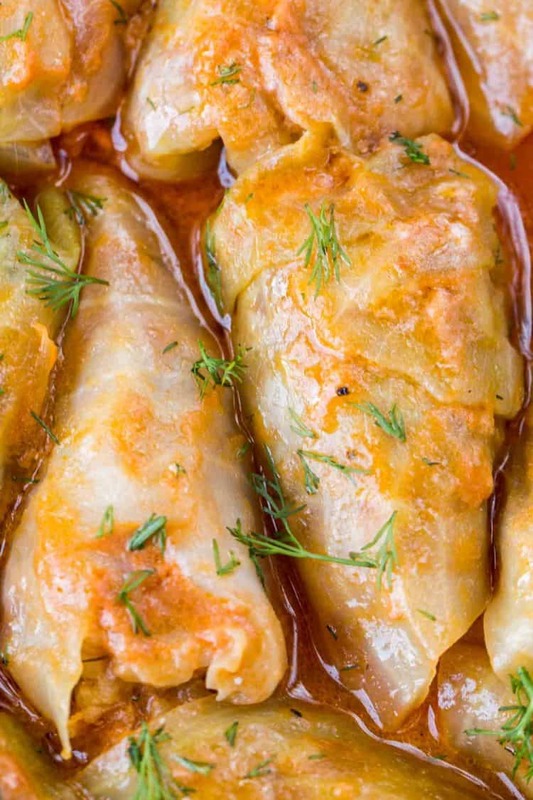 Just like Borscht and Oliver Salad, these cabbage rolls are a must in the Russian kitchen. Whenever I make cabbage rolls, it always reminds me of my mom’s cooking. I remember making these with her, such awesome memories. This recipe is hers and I’m so excited to share it. Cabbage leaves stuffed with rice, meat and veggie filling and baked in a juicy sauce. The rolls are so tender and juicy once baked. We especially enjoy making them for family gatherings around the holidays. Though the process of making stuffed cabbage rolls (pigs in a blanket) is slightly more time consuming than most recipes, it’s SO worth the wait. Cook long grain white rice 12 minutes. The rice should be cooked but not fully cooked, it will finish cooking when cabbage rolls are baking. Drain and rinse under cold water. Cover and set aside. Add to pot and cover with water. As cabbage leaves are tender and cooked, remove single leaves so they don’t turn mushy. Once cooked, layout cabbage leaves. 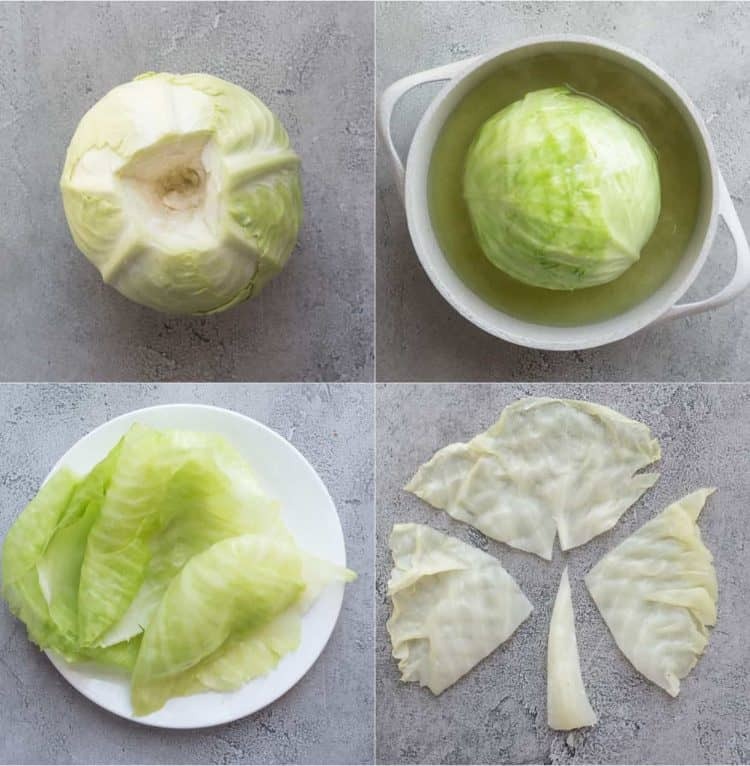 Remove the center thickest part of leaf (core) and cut cabbage leaf into 3 part for smaller cabbage rolls or 3 parts for large cabbage rolls. Chop onions, saute in a skillet with butter. Add grated carrots, cook until tender about 4 minutes. Set aside to cool. In a bowl, combine the rice, sauteed vegetables, ground meat and remaining ingredients. Mix everything until well incorporated. NOTE: We use Vegeta seasoning because we love it and that’s what I grew up using. If you don’t have Vegeta, substitute for your favorite seasoning (but you really need to purchase some, it’s amazing on everything). Reserve the thickest cabbage leaves to align the baking dish to keep cabbage rolls from burning. Take one of the leaves, add some filling to the leaf. 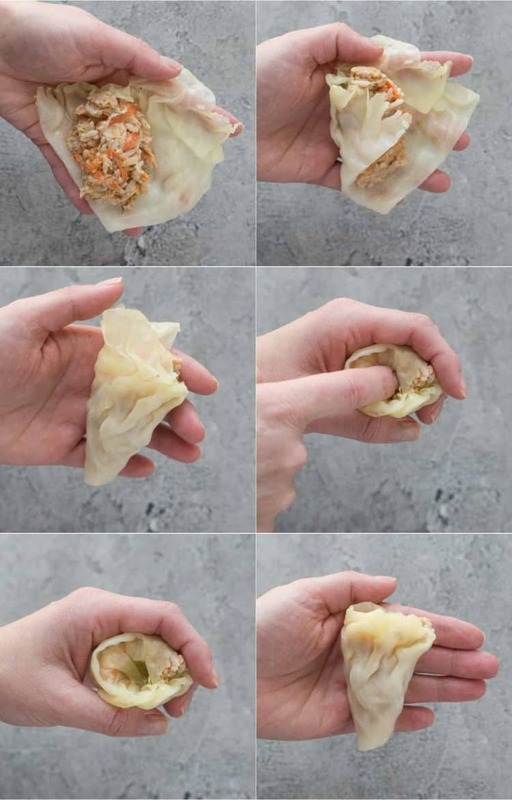 Shape cabbage roll into a cone. Take the tops of the leaf that’s sticking out and tuck it down into the filling. I like to align the bottom of my baking dish or dutch oven with leftover cabbage leaves, they keep the cabbage rolls from burning. Cover bottom of a baking dish with cabbage rolls. Layout first row of stuffed cabbage rolls over leaves. Add red pepper and butter. Add the second layer of stuffed cabbage and top with remaining butter and peppers, pour sauce over everything. Cover tops of cabbage rolls with more cabbage leaves. Cover baking dish with foil when baking. BAKING DISH: I have a really deep baking dish that I use and am able to get two rows in and fit all of the cabbage rolls. If you don’t have a deep dish, use two casserole dishes or a Dutch oven. If you will be baking the rolls immediately, you can pour the sauce while it’s hot over the stuffed rolls. If you will be making them in advance, allow the sauce to completely cool before pouring over rolls. Bring ketchup to a slight boil in a pan. Add the sour cream, heavy whipping cream, salt, pepper and mix vigorously. Add the water and broth, let cook about 30 seconds. how long do I bake stuffed cabbage? The baking time for stuffed cabbage will depend on the size of the cabbage rolls and what you bake them in. Anywhere between 1 – 1 1/2 hours for baking. can I freeze stuffed rolls? Yes, cabbage rolls freeze great and you can freeze them uncooked or cooked. UNCOOKED: Completely follow recipe instruction until you need to bake the cabbage rolls. Place in freezer, they rolls will be good up to 3 months. Completely THAW in the refrigerator before baking and bake per original instructions. COOKED: Add cooked rolls to a freezer container, will last up to 3 months. To reheat, thaw completely and reheat in a skillet with the tomato sauce over low heat. Stuffed Peppers Recipe– expected flavors, so good. Chicken Cordon Bleu Casserole– the ham and cheese filling in the sauce if wonderful. Savory Crepes– another recipe shared by mom. Baked Lemon Butter Chicken Thighs– easiest dinner. 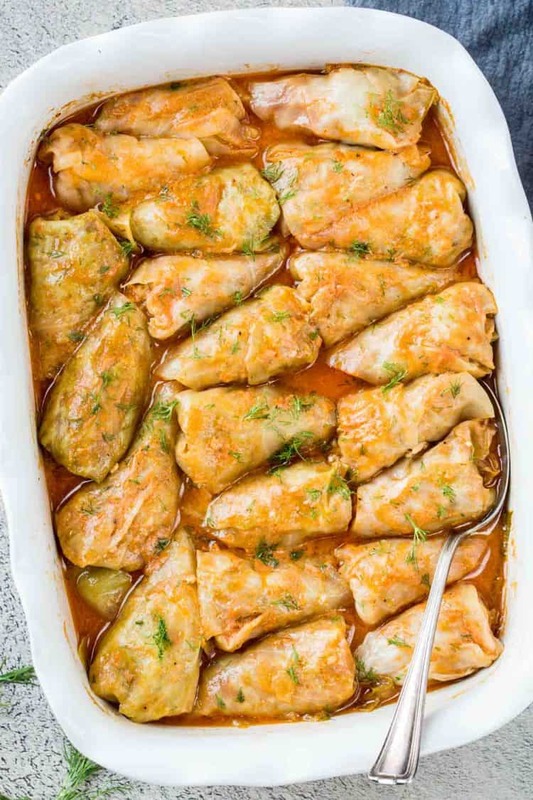 Amazing recipe for Stuffed Cabbage Rolls filled with ground meat, rice, sauteed vegetables. A classic Russian dish that is loved by all! Cut out the core from a large head of cabbage, discard top few cabbage leaves. Add cabbage to a pot and completely cover with water. Bring to a boil and cook 5 minutes. Turn cabbage over. Continue cooking and peel off any leaves that have lightly softened but not mushy. Continue until most of the cabbage leaves are cooked. Boil rice about 12 minutes, until it starts to soften. Don’t overcook. The rice will finish cooking in the oven. Drain water and rinse rice under cold water. Place in large bowl. Saute onions with 2 Tbsp butter over medium/high heat. Clean and grate carrots. 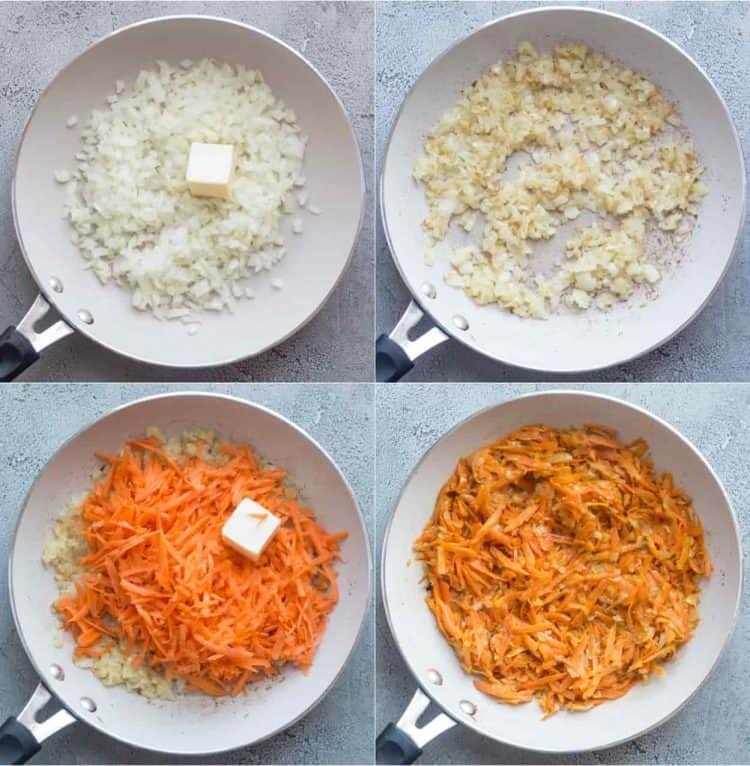 Add to onions with another 2 Tbsp butter, saute until carrots are tender. Remove from heat and set aside to cool. 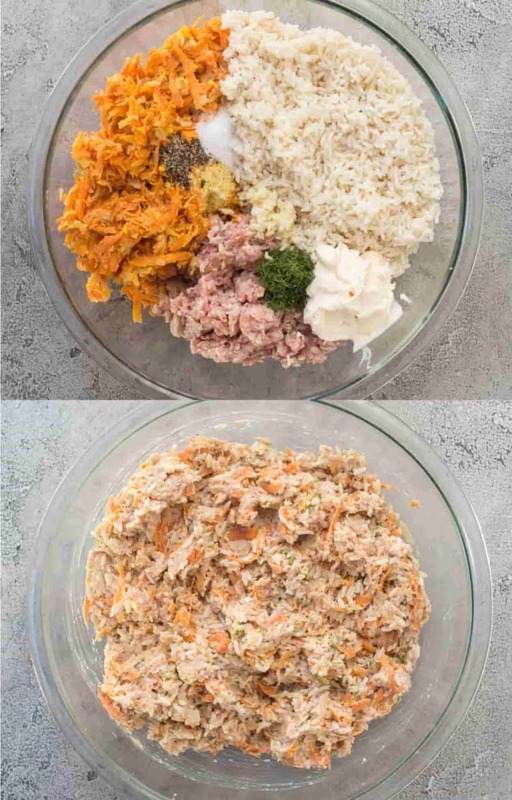 In a large bowl, combine the rice, ground meat, sauteed vegetables, seasoning, dill and mayo. Mix well to combine. Once cabbage leaves cool, take each leaf and remove the hard rib. Cut leaves into two or three parts. On the bottom of a roasting pan, add unused cabbage leaves. Take one of the leaves. Add some meat to it, shape into a cone (parts of the leaf will stick out). Tuck sides into the filling, creating a cone. Place into the roasting pan. Repeat with remaining ingredients until you have a full layer. Take the red pepper, discard of the seeds and cut into thin slices. Add half the pepper slices atop the cabbage rolls and half of the butter, sliced. 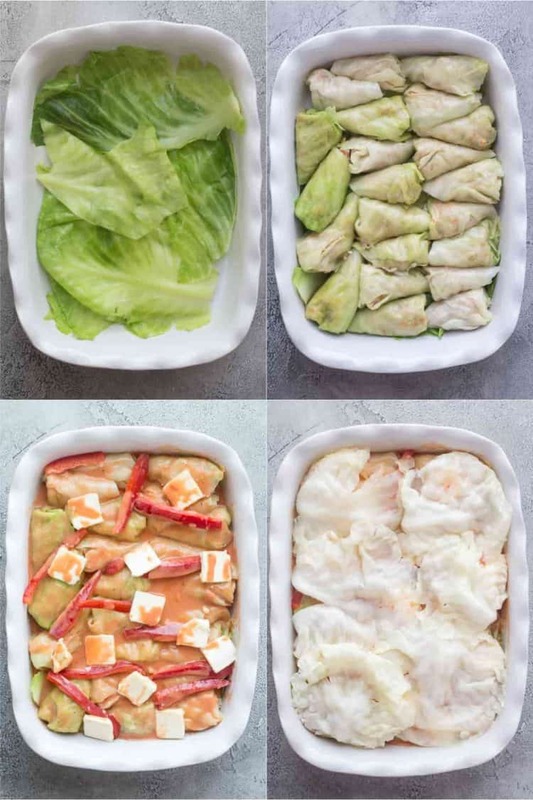 Lay out the rest of the cabbage rolls. Top with the rest of the pepper strands and cube remaining butter. Bring ketchup to a slight boil in a skillet. Add the sour cream, heavy whipping cream, salt, pepper and mix vigorously. Add water and broth, mix and let simmer about 30 seconds. Once sauce COOLS, pour over the cabbage rolls. Cover the top of the cabbage rolls with more cabbage leaves. (This will help so the top of the layers do not burn). Discard of the top leaves when serving. Cover dish with foil. Bake in oven 375°F 60-80 minutes. The top cabbage leaves will turn a nice brown color, and the cabbage rolls will be tender and soft. Serve with sour cream and fresh dill. If you don't have Vegeta, add any favorite seasoning. NOTE: This recipe was originally posted in July, 2014. We are updating the post with new images and clearer instructions. How do you warm these up for next day? Say make it the day before Easter and heat it up for Easter lunch. Hi, Olga. You can either prepare them the night before and bake them the following day before lunch, or, just reheat them in the oven until heated (covered). I hope you love the recipe as much as we do. 🙂 And, Happy Easter. Val, great step by step instructions. Love the photos, they made me so hungry in the middle of the night. Thanks for this recipe! Can I use chicken instead of pork? I’ve never used only chicken, Dana. A mixture of chicken and pork, yes. I think it would work just fine though. Enjoy! Thanks for the recipe!!! Can I use brown rice instead of white? Hey Valentina, great recipe, will definitely try it. 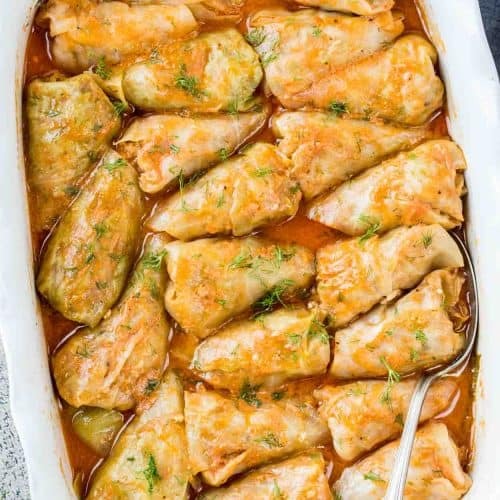 I’m from Bulgaria and we usually make them with sour cabbage, but I really like your recipe with the sauce! Oh how nice to meet someone from Bulgaria. Hmmm, you mean you stuff the cabbage with sour cream? Oh never heard of that, how neat. What are they called in your Country?